From a basic introduction to marketing for weddings, to effective online marketing for today’s wedding business. 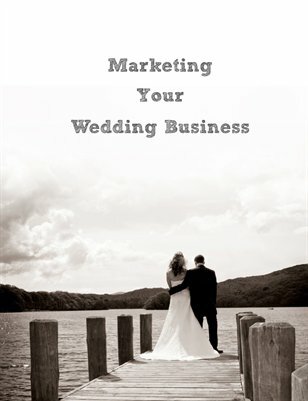 With this magazine you’ll get thinking about your wedding business potential and make it grow! Learn how to write your Wedding business marketing strategy in 30 minutes. Find out how to blog your wedding business and discover key marketing concepts: wedding market segments and targets, Marketing communications, market research and the secret to successful wedding advertising. With a special focus on marketing and advertising your wedding business online, this is a great mag for new and established wedding businesses looking for perspective, to enhance sales and reach a wider and more profitable audience. Written to appeal to beginners and experienced business owners alike, there's advice for everyone in this very affordable guide which will show you how to make your business a real success.